We’ve got lots of Loch Lomond facts. Enjoy picturesque villages, discover all there is to see and do on and around Scotland's largest loch. (Are you fit enough for Ben Lomond?) Alternatively, shop at Loch Lomond Shores or discover the cafe with the kilted waiters. There are lots of fascinating facts about Loch Lomond but the very first thing you should know is that it’s close to Glasgow, Scotland’s largest city. It’s a bit over half an hour by road and much the same by train (to Balloch). If you are new to the loch or just thinking about visiting, then here’s all you need to know - what to do and where to go. It’s in note form - so just dip in and out. The really wacky snippets are further down the page - for example, it’s true that a torpedo under test once hit a loch-side hotel (on nearby Loch Long). But first you need to know the basics. Like the Trossachs nearby, Loch Lomond was an early tourism destination and has welcomed visitors since the idea of tourism was invented more than two centuries ago. It’s the largest loch in Scotland by surface area, for a start. Today, more than half Scotland’s population live within an hour’s drive. So, it’s a popular destination for ‘local’ visitors too. Since 2002, 720 sq miles (1,865 sq km) of the landscape around Loch Lomond have been designated as the Loch Lomond & the Trossachs National Park. You can cycle with Loch Lomond only moments away for a whole 15 miles (24 km) between Balloch and Tarbet. The West Loch Lomond Cycle Path is traffic-free for much of its length. Families with young children and casual recreational off-roaders (a posh way of saying ‘folk who like cycling on quiet paths’) have plenty of options, especially on forestry tracks. National Cycle Route 7 also passes this way for dedicated long-distance types. And, as you would expect of a place with such well-developed ‘infrastructure’, cycle-hire, information boards, supporting leaflets and cyclist-friendly accommodation are all easy to find. For sailing, swimming and so on, you’ll enjoy the 2,628 cubic metres of water in Loch Lomond. Best advice here is to float on top of it, of course. You’ll find 71 sq km (27.5 sq m.) of surface area - enough to keep all the leisure craft and canoeists apart, most of the time. It is fair to say that this, the largest surface area of any water body in the UK, can get a bit crowded at peak times. (Picture here) The ambience of the upper part of Loch Lomond in early spring. Cruising is already under way though. That looks like a ‘Cruise Loch Lomond’ boat. Yikes, I’m turning into a ferry-spotter. Nearly forgot, there’s angling galore if that’s your thing. When the famous General Wolfe of Quebec was a mere Lieutenant Colonel stationed at Inversnaid near the loch around 1753, he was supposed to be chasing Jacobites after the Battle of Culloden. However, he had his fly-fishing rods with him. This suggests that the loch’s reputation amongst anglers is at least 250 years old. Part of this reputation is for monster fish – Atlantic salmon, sea trout as well as record breaking coarse fish such as perch and pike. The Loch Lomond Angling and Improvement Association is the key to everything you need to know about the area’s angling, by way of permits, quarry species, seasons, restocking programmes and so on…. Well, there’s a choice of golf courses, pony trekking options and seaplane rides - and all that comes after you’ve probably visited the large shopping and leisure complex of Loch Lomond Shores, at Balloch at the south end. One of Sweeney’s Cruises, returning to the base at Balloch on the River Leven, with Loch Lomond behind. What else can I do around Loch Lomond? Here are some suggestions for spending your time in and around the Loch Lomond & Trossachs National Park. Visitors have been climbing Ben Lomond for fun since 1756, when the first recorded ascent was by – can you believe it? - a bunch of students. It soon became a popular day out. Yes, it’s an odd suggestion – but this dumpling sits at the south end of Loch Lomond and is otherwise known as Duncryne Hill. Go to the village of Gartocharn and drive out on Duncryne Road - park in a layby by the road and follow the signs (which are a little idiosyncratic and warn you about not disturbing the teddy bears - as I recall!). A few minutes’ walk (short but steep) gives a superb reward – a spectacular panorama up the loch to the mountains beyond the Highland line. The House of Darroch in the village is good for a snacks, lunch, cakes and even shopping for gifts too. You know that Rob Roy Macgregor was real and not just Liam Neeson dressed up? And Rob Roy really did become a legend in his own lifetime (thanks to Daniel Defoe, of Robinson Crusoe fame, who wrote a book about him). Anyway, all famous historical Scots, such as William Wallace, Robert the Bruce and Bonnie Prince Charlie, had to have caves. It was an image thing. Rob Roy’s cave is north of Inversnaid, by the lochside, easily accessible as a wee diversion from the West Highland Way. As it’s quite hard to spot – which was a useful function of a cave for hiding in – these days it has the word ‘CAVE’ in big white letters painted outside, which is very helpful. Within easy distance of Loch Lomond, Glengoyne Distillery is tucked below the western end of the Campsie Hills. It’s a scenic and a relaxing setting, totally in keeping with the intention of the folk who make the whisky there. They want you to slow down and relax. After all, their malt whisky is distilled at one-third of the rate of any other malt whisky. Johanna says that if I mention whisky I should mention beer as well. OK. Right. The Loch Lomond Brewery have a shop at their brewery at an industrial estate in Alexandria at the south end of the loch. (Well, you can’t do totally scenic all the time and, besides, they welcome visitors). Meanwhile the Balmaha Brewing Company says they are ‘nestled’ in the National Park and, indeed, you’ll find their Oak Tree Inn doing its nestling thing just beside the Balmaha Boatyard, where you’ll go to get across to the wee island of Inchcailloch. Right? It has lovely oak woodland, bluebells in May and lots of other interesting botany, plus a stunning viewpoint. 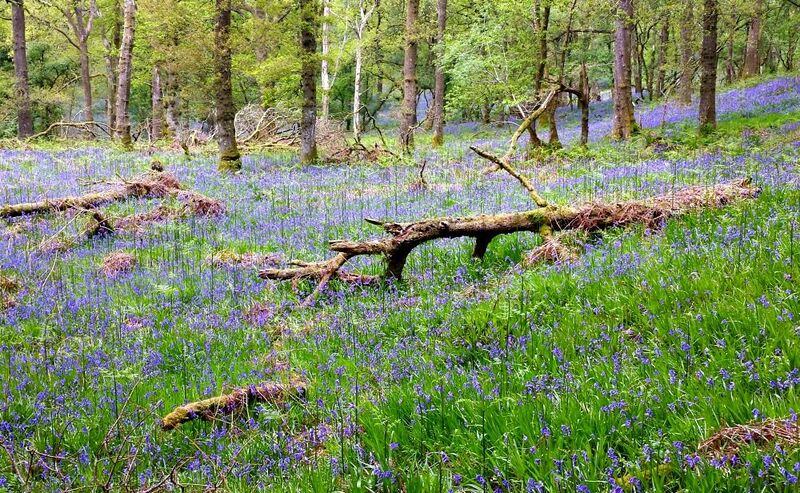 Carpets of bluebells on Inchcailloch - Loch Lomond. The Vikings were so keen on cruising on Loch Lomond that they brought their own boats with them. Strictly speaking, they were really looting and pillaging, so this may not count. However, cruising and boat trips have been available on the loch since Victorian times – one of today’s operators was here by the 1880s. Today, cruising is handled by a number of operators and in a variety of formats. These could include island landings, pub visits, barbeques, live commentaries and private charters and can be from one hour upwards. Whatever the programme, it’s a great way of getting to know the loch. From Portnellan Farm (pictured here) you can go speedboat cruising (but book in advance). Ferry and cruise operators include Cruise Loch Lomond, also Loch Lomond Leisure (all kinds of craft hire) and Sweeney's Cruise Company. (They've operated on the loch since the 1880s. From the West Highland Way by Loch Lomond or by the shores of Loch Long, your eye is drawn to the profile of The Cobbler. It’s simply one of Scotland’s most easily identifiable mountains. Though at 2891 ft / 881 metres it doesn’t qualify as a Munro (a mountain over 3000ft / 914 metres), it’s long been a popular excursion. Walkers and rock-climbers are drawn to its craggy skyline, with that distinctive overhang, seen from certain angles (though not the one immediately below!). Take care, will you? High summer on the Three Lochs Way. The Cobbler is on the skyline, there's a glimpse of Loch Long, lower left, and the foxgloves (pink, foreground) are in flower. Loch Lomond is just over the hill. Glen Falloch has some noted waterfalls. The English Romantic poet William Wordsworth called it ‘the vale of awful sound’ – just the sort of thing a romantic poet would say. The Falls of Falloch are probably the best-known and make a pleasant little leg-stretch in fine Highland scenery if you find yourself above Loch Lomond on the Crianlarich stretch of the A82. They are easy to find – there’s a big brown sign and a car park! Long ago, Luss was a place of pilgrimage associated with St Kessog. (He was a Irish saint who lived on the nearby island of Inchtavanich in the 6th century AD.) Today, the attractive lochside community of Luss is still very much on the visitor list, with fine prospects of the loch, its islands and the peak of Ben Lomond. The Colquhoun family features prominently in the village’s story. In the early 19th century, they built the present Luss village to accommodate their estate workers. Luss and this area has lots of lovely hotels and guest houses too. 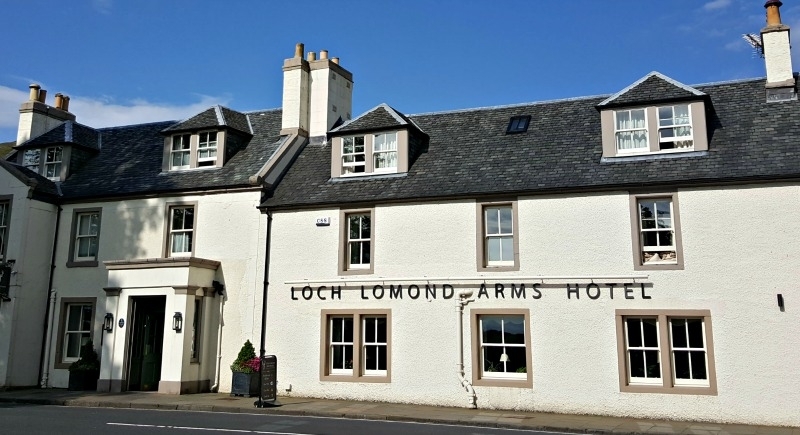 We especially like the Loch Lomond Arms Hotel in Luss. Luss is a fine example of a ‘planned village’. It has seen little change since its construction and is a designated Outstanding Conservation Area. In other words, it’s pretty and you’ll like it! Another one for your ‘Loch Lomond don’t miss’ list. Oh, and Johanna says you’ll enjoy the Coach House Coffee Stop as she reports lovely soups, haggis and home baking, as well as kilted waiters. PS Maid of the Loch - will she sail again? (Picture here) Alas, the Maid of the Loch no longer sploshes her way around the loch. She was the last paddle-steamer built in the UK (in Glasgow in 1953) and is laid-up undergoing a long-drawn-out restoration close by the Balloch Steam Slipway, itself a venerable piece of machinery dated 1902). If you tire of the retail experience of Loch Lomond Shores, then you can stroll round in a few minutes to inspect her. Balloch grew up around an early ferry and river crossing point at the south end of Loch Lomond. As tourism and leisure time developed in the 19th century, Balloch’s moorings on the River Leven attracted steamers, boat-hire, cruising and the air of a place where city-folk came to enjoy themselves while messing about with boats. The arrival of the railway also helped. Today, Balloch’s role as a gateway to Loch Lomond takes the form of the Loch Lomond Shores complex, where interpretation, activity choice and retailing all fulfil the needs of the 21st-century visitor. You can experience lots of quality shopping here plus a farmers' market – but the view up the loch and across to the laid-up paddler The Maid of the Loch is free. There’s parking, camping and accommodation including a youth hostel and hotel – plus a lot of folk putting their boots on and setting off for a walk – Loch Lomond looks tempting, while the West Highland Way carries on north. The Way also goes on through Inversnaid, another way of reaching the east side of Loch Lomond by road. On this east-side road to and from Rowardennan, there are plenty of picnic places and stopping-off points, including Sallochy (look for the parking sign) with its choice of woodland walks. Conic Hill is on the skyline behind the village of Balmaha. It gives great views over the Loch Lomond islands. The Oak Tree Inn (back view!) is in the foreground. It also has its own micro-brewery. The road, bottom right, runs down to the Balmaha boatyard, from where you can hop over to the island of Inchcailloch. Further south is Balamaha with its boatyard offering cruises and trips. Climb Conic Hill from here via the West Highland Way for a superb view across the Loch Lomond islands. Buchanan Smithy and Milton of Buchanan are little settlements between Balmaha and the larger community of Drymen. There is a good choice of accommodation in the area, with further shops, pubs and cafes in Drymen. Also within easy distance of Loch Lomond are communities such as Gartocharn, with stunning views from Duncryne Hill, just behind it, and, further east, Balfron and Killearn. These are attractive communities on the edge of the Campsie Hills, and good touring centres with accommodation choice. The scenic spectacle draws visitors north along the main loch-side road, the A82, beyond The Carrick, the golf course at Arden. 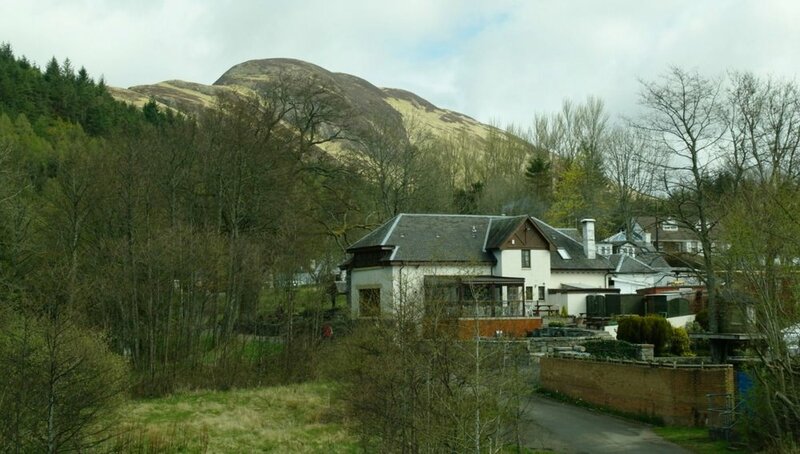 Many make a stop at the attractive estate village of Luss, already mentioned above. A few minutes further north, Inverbeg with its Inn and other accommodation, holiday park, gallery and pier, is another scenic diversion. Continuing north, Tarbet is a long-established settlement at the road junction for the west. Accommodation and boat cruises, as well as pleasant loch-side strolling, are all on offer here. At Tarbet, the road splits, one route going further north by the loch, the other heading west and over to Arrochar at the head of Loch Long. The tide is out at Arrochar at the head of Loch Long, Loch Lomond's neighbour, though a sea-loch. Arrochar sits in an attractive setting below wooded slopes. There are fine views of the Cobbler, plenty of accommodation choice and the village is also on the Three Lochs Way walking route. Further on, the A83 continues west by the Rest and Be Thankful for Loch Fyne, Inveraray and beyond. Back on Loch Lomond, Inveruglas is a definite ‘photo-stop’ with easy parking. It has a passenger-only ferry connection to Inversnaid on the opposite bank. It’s also the place where serious walkers set off for a day in the peaks of the ‘Arrochar Alps’. At the top of the loch, Ardlui is another popular stopping-off point with its accommodation choice, marina and, close by, the inn where Rob Roy himself slaked his thirst more than once. The main road then climbs north through Glenfalloch with fine views of the high hills around Crianlarich. East along Glen Dochart, the Falls of Dochart at Killin are picturesque – especially impressive in spate...but not really within the Loch Lomond 'sphere'. Just a couple of minutes along the road from the Balloch, a rural community hidden between road and shore. Accommodation, places to eat, ferry terminal for Inchmurrin – plus a championship golf course – the Carrick. In Clan MacFarlane country (and once the seat of the chief), Arrochar was a kind of natural route centre at the head of Loch Long and also on a later military road between Inveraray and Dumbarton. A pier for steamers, then the arrival of the railway both helped visitors discover the unique appeal of Arrochar’s location below the grand hills. Today the community still welcomes plenty of visitors with a good choice of accommodation and places to eat. An attractive little community close to the south end of Loch Lomond, with easy access to the loch. Duncryne Hill, viewpoint and landmark, rises prominently behind the village. Popular stopping-off point by Loch Lomond, beautifully sited with islands offshore. A ‘planned village’ for the local estate and a designated ‘Outstanding Conservation Area’. Good accommodation choice and places to eat. In Gaelic ‘a place of portage’ – in this case between Loch Lomond and the salt water of Loch Long – Tarbet is on an important junction between west and north. As an old-established community catering for travellers, many famous names have passed through here, including Robert Burns and the Wordsworths. As well as accommodation and places to eat, it has an attractive shoreline and offers regular loch cruising. An attractive little loch-side community with a sylvan setting and a little bay sheltered by the island Inchcailloch. Popular stop-off point on any excursion up the east side of Loch Lomond; also where the West Highland Way meets the Loch. Good accommodation choice and places to eat – plus boat hire and boat trips. It’s beginning to sound like the essential Loch Lomond experience. Originally a bridging point on the Endrick before it reached Loch Lomond, now an important gateway community for Loch Lomond and the National Park. Good choice of accommodation and friendly pubs. Here’s our tip just for you: go through a little gate on the north side of the main road (opposite the Buchanan Arms Hotel) and a two minute walk reveals a brilliant view of the loch. Once an old cattle-droving stopping-off place, complete with nearby inn, at the head of Loch Lomond. Today, lots still go on here. There is a marina, boat cruises, caravan park, ferry to take walkers on to the West Highland Way, plus a choice of refreshments and accommodation. Good base for local walking excursions: perhaps exploring the old drovers’ route into Glen Gyle, or a big day on Ben Vorlich. More on Loch Lomond - some of the odder facts and stats. Loch Lomond is only 27ft or eight metres above sea level. Only because a melting glacier dumped a load of earth and rocks down at the south end, did it become a proper inland loch - dammed by the material - and not just an arm of the sea like its fjord-like neighbour, Loch Long. That all happened at the end of the last Ice Age, around 10,000 years ago. Loch Lomond has a larger number of native and introduced fish species than any other loch in Scotland, with 15 native species. This includes the powan, confined in the UK to a few lochs and tarns. The number of islands on the loch varies depending on its water-level. If tree-cover is used to define islands, this gives a figure of 39. Of the islands of Loch Lomond, Inchmurrin is the largest island in an inland loch (or lake) anywhere in the UK. And how deep is Loch Lomond? Well, we've a whole page on that topic. Follow the link. In the 1953 US film ‘The Beast from 20,000 Fathoms’, about a giant dinosaur-like creature that attacks New York, the dialogue makes more than one reference to ‘The Loch Lomond Monster’ as evidence that weird creatures exist. Presumably they meant the name of another loch? Or do they know something we don’t? And, sure enough, at the height of the Loch Ness monster mania, many years ago, the crew on the footplate of a steam locomotive (the railway also overlooks the top section of the loch) also saw something they thought was a large swimming creature of unknown origins. Yeah, right. Growing nowhere else in Britain, the Loch Lomond dock (Rumex aquaticus) was only discovered in 1935. This was odd as it grows up to two metres tall! Hardly an inconspicuous wee thing. The first successful unpowered flight in the UK was made in 1895 in a field above Cardross by Percy Pilcher, in his glider called ‘The Bat’. A lecturer at Glasgow University, he went on to build larger gliders, successfully flying them. He was on the point of attempting a flight in a powered machine when killed in a gliding accident. Captain Haddock is Tintin’s best friend in the famous Belgian cartoon and story series. His favourite whisky is a brand called “Loch Lomond”. Blistering barnacles! In the summer of 1787, Robert Burns was probably Loch Lomond’s most famous visitor up to that time, unless we count Rob Roy, though he was a resident. Next day, none too sober, with his companions and mounted on the road, he was overtaken by a Highlander, also on horseback. Burns raced him, and overtook him. The Highlander checked his horse, which fell, and Burns likewise went down. Loch Long from the Three Lochs Way, looking down the loch and away from the Highlands. (Pictured here) An especially attractive section of the Three Lochs Way (34 miles ' 55km) that runs through the sea-loch fringes of the Loch Lomond & Trossachs National Park. Between 1912 and 1986, Loch Long was the site of a torpedo testing range. Every torpedo supplied to the Royal Navy at one time was test-fired down the loch (without a warhead!). Usually all went well and the devices were recovered and delivered as required. Once, in the 1950s, one went astray and gave a local steamer a bit of a bump. Worse, a few years later, another torpedo went well off course. The missile left the water, ploughed up a beach, over a lawn and crashed through the French windows of a lochside hotel. The Loch Long range is thus unique in managing to torpedo a hotel! Ben Ledi is a conspicuous landmark on the very edge of the Highlands, above Callander. It's a great day out. Good footwear and chocolate are recommended. Scotland tourism started when things got peaceful. In the Trossachs, the visiting Romantic poets were charmed. The Cult of the Picturesque took off. Blockbuster poem 'The Lady of the Lake' helped back in 1810 - and visitors have been coming here ever since. Demonstrations also took place at Balloch, where walkers wanted to reach the south shores of Loch Lomond. Today, both areas, naturally, are open to all and actively managed for recreation and walking. It is thought that by 1816 the illegal stills on the islands of Loch Lomond were producing an estimated 100 gallons a day for consumption in Glasgow. (Picture here) One of Scotland’s oddest attractions in the Loch Lomond area, down by Dumbarton and the Clyde. The Denny Ship Model Experiment Tank did what its name suggests. The shipbuilders Denny tested models of ship hulls in a 300ft (90m) tank. Built 1882, the tank complex retains many original features, except the shipyard of which it was once part, which closed a long time ago. The tank is part of the Scottish Maritime Museum. (And finally) Though the Cutty Sark is possibly the most famous Dumbarton-built ship, the now-vanished yards here were pioneering in their day. The first ever steamship to cross the English Channel, the ‘Margery’, also came from Dumbarton. The largest-ever inland waterway fleet – Burma’s Irrawaddy Flotilla – as mentioned in Rudyard Kipling’s ‘Road to Mandalay’ - was also built here. Imagine - all this industry going on - and only minutes from 'the bonnie banks'. Best way to see the Loch Lomond area? Go cruising Loch Lomond. Especially in summer to avoid the biting clegs and midges. Seriously - avoid driving the Aberfoyle-Stronachlachar-Inversnaid at peak times. We'll tell you why. How deep is Loch Lomond? At 623ft /190m it’s the third-deepest loch in Scotland and the largest by surface area. Also answered here: where is Loch Lomond - plus how it was made and how the Romantics discovered it. The loch hasn’t got a monster. But it has an upmarket shopping experience, Loch Lomond Shores, at Balloch.